The EMS-Tech sales team has announced the signing of an additional three EQUINOX-class self-unloaders for Algoma Central Corporation — contract signing took place in Rijeka, Croatia on Friday, 11 March 2016. The Laker classed self-unloaders will be constructed in Rijeka, Croatia at 3 MAJ Shipyard, part of the Uljanik Group, along with the Algoma 650s contracted late last year. The first of the three 740s will be delivered in Quarter (1) 2018. 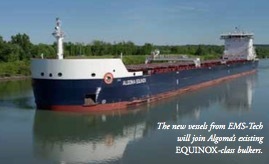 The EQUINOX class represents the next generation of Great Lakes - St. Lawrence Waterway bulk carrier vessels. The EQUINOX-class vessels have been specially designed to optimize fuel efficiency and operating performance, minimizing their environmental impact. technology integrated into these new generation self-unloading bulk carriers, and looks forward to working with the Uljanik Group to successfully deliver these new vessels to Algoma Central Corporation.